Okay, the poll is closed. Only one person bothered to vote anyway, and whoever you are, Congratulations. 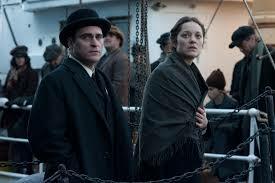 You made me watch The Immigrant. Tech-wise, this is an impressive film. The look of 1920’s New York is realized pretty well, complete with some impressive costumes. The cinematography is pretty good, too. However, I feel this film had potential to be more than what it ended up being. The film’s main problem lies in its rather poorly written script. Of course, if your movie stars two actors as talented as Marion Cotillard and Joaquin Phoenix, that certainly helps. These two are quickly becoming two of my favorite actors, and the range they show here is a good indication of why. Cotillard is great at showing her characters’ desperation, while Phoenix always has you on edge. Although I would like some clarification on whether Phoenix is campaigning in lead or supporting, as I could see either. Now, while this isn’t a horrible film, there’s nothing about the film that makes it a huge contender, outside of the performances by the two leads. And even then, both Cotillard and Phoenix have other films in the running that they’ll probably get better notices for. The film was enjoyable while it lasted, but personally, I’d skip it.